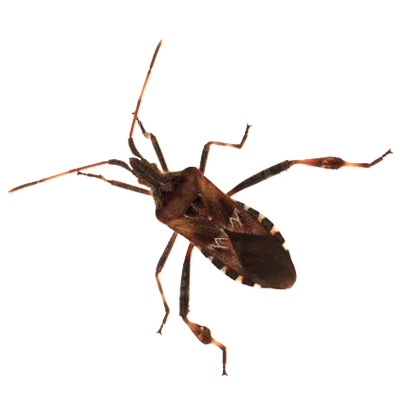 The Western Conifer Seed Bug is often mistaken for a stink bug. However, it has a longer body. The hind legs of a Western conifer seed bug are also widened and look like a tiny leaf is attached, whereas the stink bug’s legs are straight and cylindrical. Sometimes called the “leaf-footed bug.” They are about 3/4 inch in size, and are brown with reddish brown and dark brown markings and a checkered pattern of brown and white along its edges. It feeds on conifer seeds as well as other seeds. They make a loud buzzing noise when flying and can be a nuisance when they make it inside your home.